Do you know the easiest way to add holiday cheer in a flash? Throw a pillow on it! Maybe you think that it’s too costly to purchase throw pillows that will only be around during Christmas. 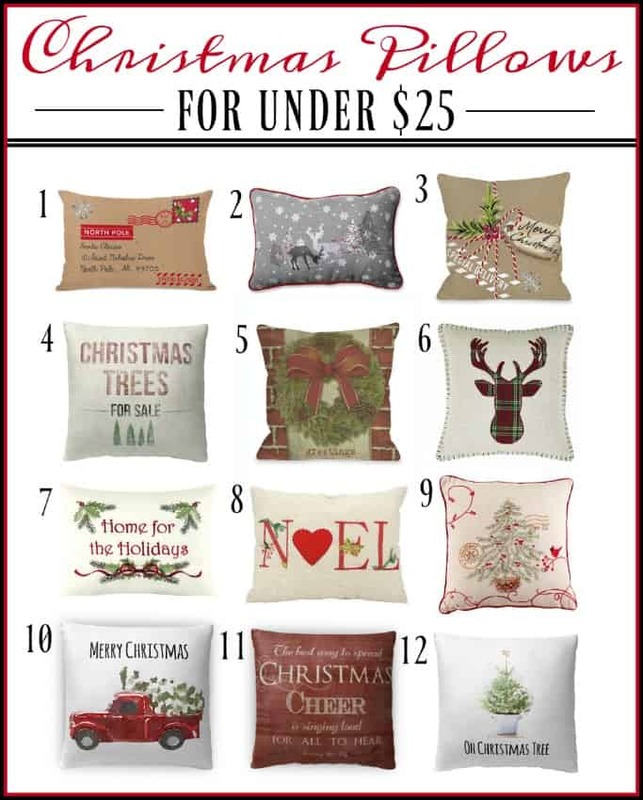 Well…I’ve done the shopping for you and have come up with a list of twelve farmhouse style Christmas throw pillows for under $25! 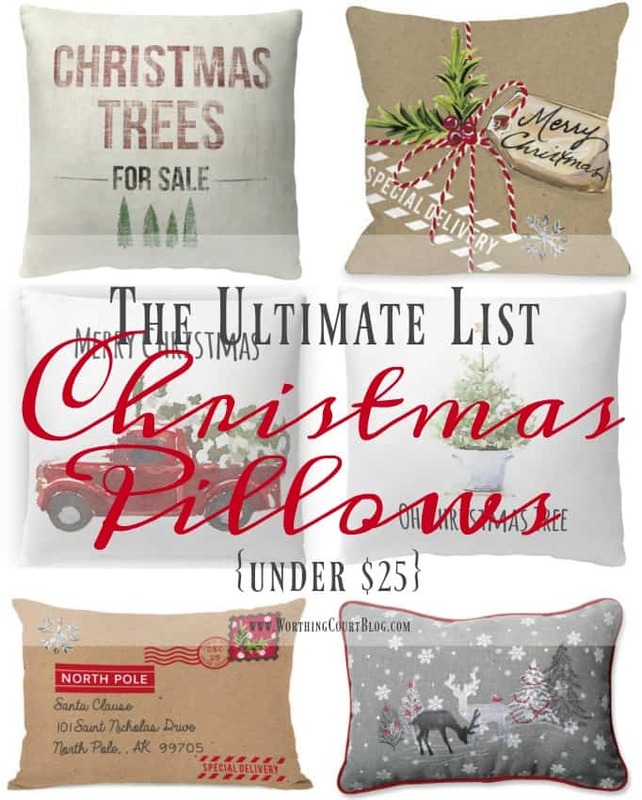 I would be excited to showcase any one of these pillows as part of my Christmas decor. Simply click on the name of the pillow, below the image, that is associated with the number on the image to take a closer look at it. This post contains affiliate links for your convenience at no additional cost to you. See my full disclosure HERE. So tell me – do you have a favorite? « Bookcase Makeover – Traditional Cherry To Farmhouse Fab! Love #3 and #10! Both have pops of red which I adore. Happy almost Christmas! #12 is my favorite, but #10 is a close second. It is so fun to have Christmas pillows around the house. My husband agrees with yours about pillows around the house. I can’t decide between #10 & #12! I love them both! Love #2 – unique “unChristmas” Christmas pillow! My favorite one is No. 10 – very cute!! Love the variety of pillows, especially the ones with a vintage flavor. Something for everyone. I like #6 the best, but they are all adorable. If I get this one I am gluing a bright red Pom Pom to his nose! #10! I love bringing home a tree for Christmas. I’d love to have this pillow to remind me of all the happy times my husband and I shared when we shopped for our trees. This will be my first year without him. I love them all . Thank you for sharing!! That reindeer is pretty durn cute!! I love the stitching on the plaid deer… great round up! I love the choice and styles. It makes it feel like home. I love them all! Adding a throw pillow, inside your home or on a deck chair outside, says Welcome! So cute! Wish I had more room for these in my Wee Abode! I love #10! Might have to snag that for my decor this year! Thanks for sharing with us on the Family Joy Blog Link Party! Love these pillows. Add that extra touch to holiday decorating. I love 10. They are all so cute, its hard to choose. Some super cute ones! Thanks! Numbers 3, 8 and 10 are my favorites, but really, they are all so cute. Where did you find these? Your house is beautiful and so shows such a clear theme. Hope you approve if I appropriate some of your vision. Going to start today as I never decorate until the calendar says December 1st. Hi Sue. I love every one of them too and would have a hard time picking just one. I found them all online. In case you didn’t see it, there’s a link to every pillow directly under the image. I love your beautiful pillows! My choice is #10. You have such neat ideas. Thanks for sharing. No. 6 hands down is my favorite! I love #4, 10 and 12! Nope, the links don’t work. Just bring up a black jpeg page. Hi Betty. I’m not sure what the problem is. The links work fine for me and no one else has notified me that there’s a problem. Maybe it would help if you cleared your cache and came back and tried again. Sorry I can’t be of more help! I love #4 Christmas trees for sale! It’s not over the top so it would go with any Christmas theme in your house from year to year! You can never have too many Christmas pillows! Number 4 and 10 are my favorites. Love all the “white space” along with a pop of color and Christmas whimsy. I have recently begun my love affair with pillows and consequently I’m starting to gather quite a collection. They are quite fool-proof as a design element. I would love to say that pillows are my one weakness, but i would be lying. They are one of my weaknesses though! I love pillows. I’m hoping for one of these for Christmas. 10 All the way ,!! Love these! Oh these pillows are so charming but so are many of your pictures on your Blog. Number 1 pillow reminds me of the sweet friends who send mail during the holidays. I love the colors of the red, green and white against burlap in pillow #3 though too. All of them so festive, but my fav is #10! Great pillows! My favorites are #10 and #12. Just love these pillows…so hard to choose a favorite, but like the truck with the tree the most. I,m now on a mission to add some to my Christmas decorating. It is a tossup between 1 and 3 for me, although all are cute. I absolutely love these pillows, I love each and every one of them. I love getting your e-mails, always such beautiful things. Absolutely my style!!!!! HomeGoods has all their Christmas pillows half off. Lots of beautiful ones still available! My favorite is #4, but I love them all! The more pillows, the better!! A gift card would be helpful!